What Do Cheap Cars Mean for India's Cities? 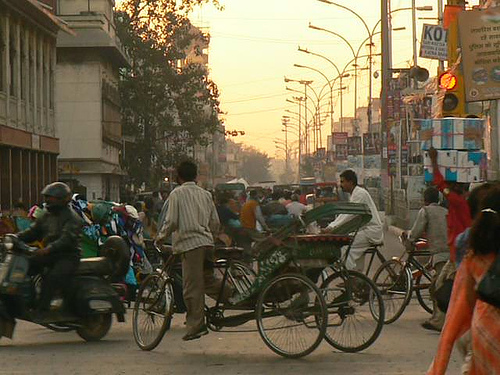 An Indian street scene. Photo by Satbir from Flickr. Last week the New York Times and the International Herald Tribune ran a story on the new Tata Car priced at $2,500 coming out in India in 2008. Some time ago NextBillion covered the new car from the “Bottom of the Pyramid,” angle and the NYT and IHT did more of the same, framing the debate around its affordability; like Ford’s Model T, it’s a car designed for the masses. What’s conspicuously absent from the reporting is what cheap cars actually mean to India. With poor air quality already a major problem in many Indian cities, the increase of cars will only make things worse. And because poor air quality is directly linked to respiratory diseases such as asthma, bronchitis, and lung cancer we can expect more people to fall ill as millions of new cars flood the roads. Traffic is another concern. To cope with a greater number of cars on the road, India will have to start investing in infrastructure, highways, parking garages, etc., money that could be spent on other things like mass transit, hospitals, schools, you name it. And as more money is poured into traffic infrastructure more people will have greater incentive to buy a car, which in turn will drive demand for ever more highways. Where will these highways go? My guess is that people will have to be relocated to make room for the roads. That’s what happened in the United States, at least; neighborhoods were sacrificed for expressways. These are the real costs of cheap cars, a price that is not reflected in the price tag. The question we should be asking ourselves is if these costs are really worth it. And if they aren’t, why not spend more money investing in good quality mass transport?